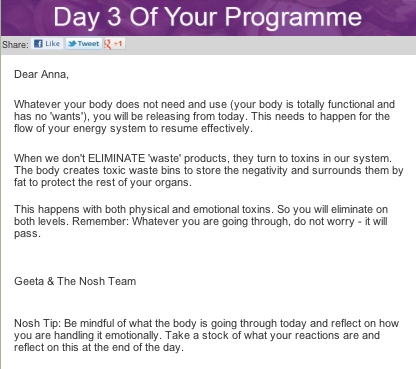 I’ve just completed a 3 day Raw Detox programme with a company called Nosh. Great name for a company! 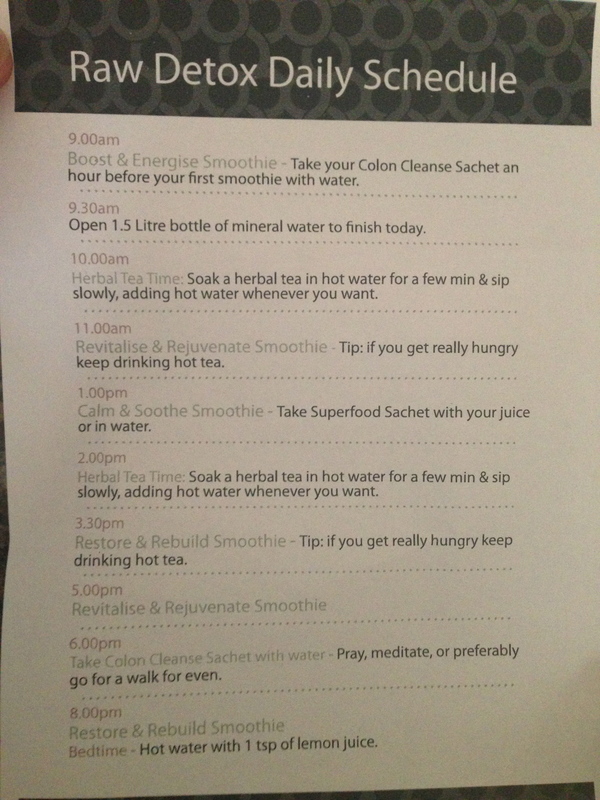 Another pre-prepared juicing programme which includes 18 smoothies, six ‘colon cleanse‘ sachets, three ‘superfood booster‘ sachets and a phone call with a nutritionist. This programme appealed because of the variety of ingredients in the smoothies together with the addition of spirulina, chia and acai. However soon after I placed my order I realised why Nosh is reviewed with such complimentary comments (I googled it before placing my order). 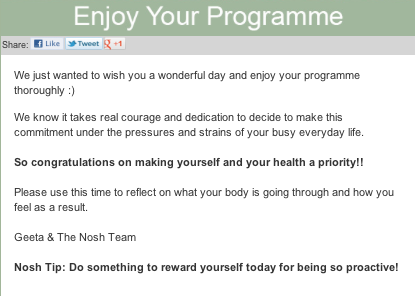 It’s not JUST a juice/smoothie programme but truly offers a service. On placing my order I received an automated acknowledgment. This was closely followed by another email that urged me to book my time slot for a phone consultation with a nutritionist at the end of my 3 days. Then a couple of days before my delivery was due I received the below email. 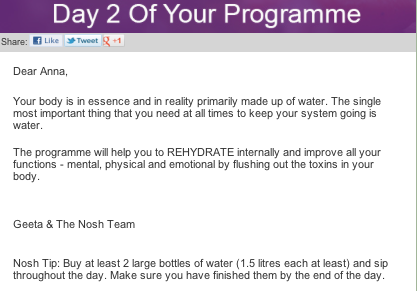 What a wonderful way to prepare people for their detox. Working with them to consider what lays ahead and coach them, utilising some simple email text, into the right frame of mind. I then received this email the day before delivery. My smoothies were delivered early Sunday evening. Again I’ve got to applaud their delivery slot as let’s face it a Sunday evening delivery is a great time for people to be in and also to prepare for the week ahead. As I unpacked the bottles I noticed something wonderful on the labels. The ingredients of each bottle also contained ‘Love’ ‘Joy’ ‘Bliss’ and ‘Happiness’. What a fun touch. Also in the box was one sheet of paper with all the instructions I needed for the three days. Honestly, how easy is that to follow? I have to confess that I like a schedule to follow. I like it to have times to follow too. Otherwise I find that I’m spending too long hovering around the fridge or in the kitchen and that may lead to temptation. Also reminding me to drink water and hot drinks. It probably sounds daft to need to be reminded but it helps. On each day I received an email encouraging me. On my third day, I’d booked in for a chat with the nutritionist. 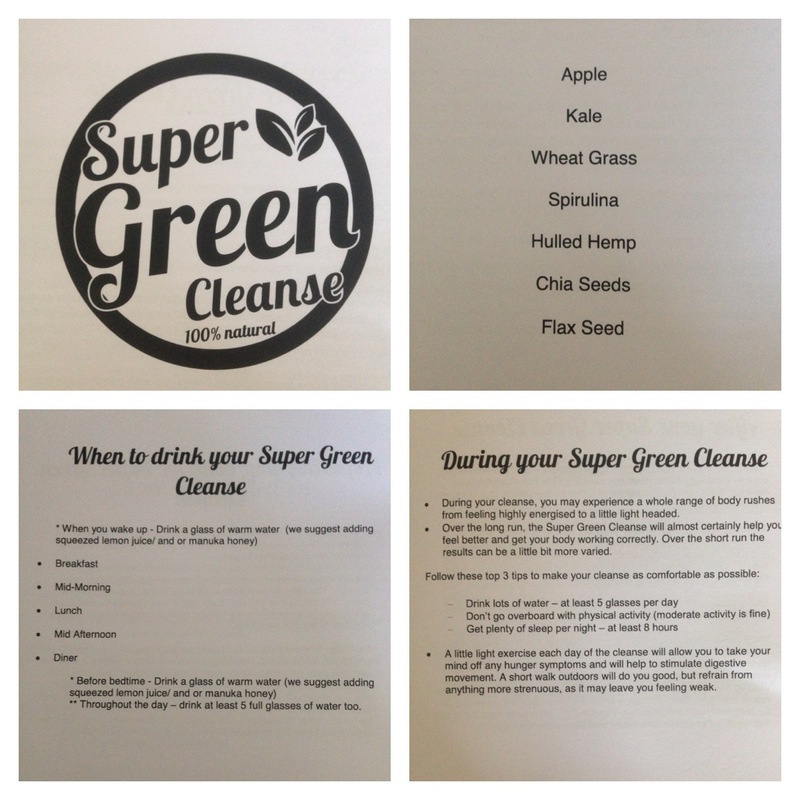 A very useful end to the programme which allowed me to ask questions about the programme, mention what I’d like to take forward and receive advice about why certain vegetables and fruits are good for juicing and also if there are any additions or supplements that might be good for me. 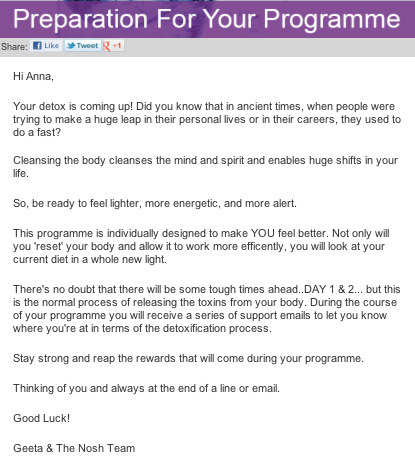 A final email the day after I completed the 3 days with suggestions of how to maintain the benefits from the detox and continue with this healthier approach. Was I hungry during the cleanse? Very rarely. The smoothies were well balanced in their thickies and thinnies which meant that I wasn’t physically hungry. Also being reminded to drink lots of water helped when my head (not my stomach) was saying it was time to eat. So much easier to ignore or quieter when I’ve been drinking water or hot water with lemon juice. Did I get congested? A little on the first day or so. However day 3 was definitely an elimination day… but not so bad that you worried about leaving the bathroom! Would I do it again? Yes but I’d definitely prefer with a discount or offer. With the LivingSocial offer each smoothies was £3.83. 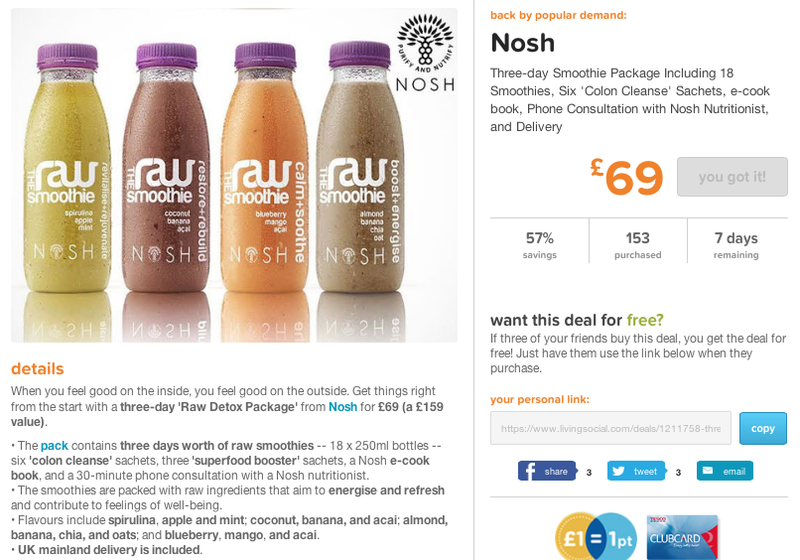 At full price the smoothies would be £8.83. However you also get included the superfood booster supplements and cleanse sachets and a telephone consultation with the nutritionist. Do the smoothies last in the fridge? Yes. Would I recommend it? Yes and even, if you can afford it, at the higher price. It’s not cheap but it’s certainly a full service that you’re getting. 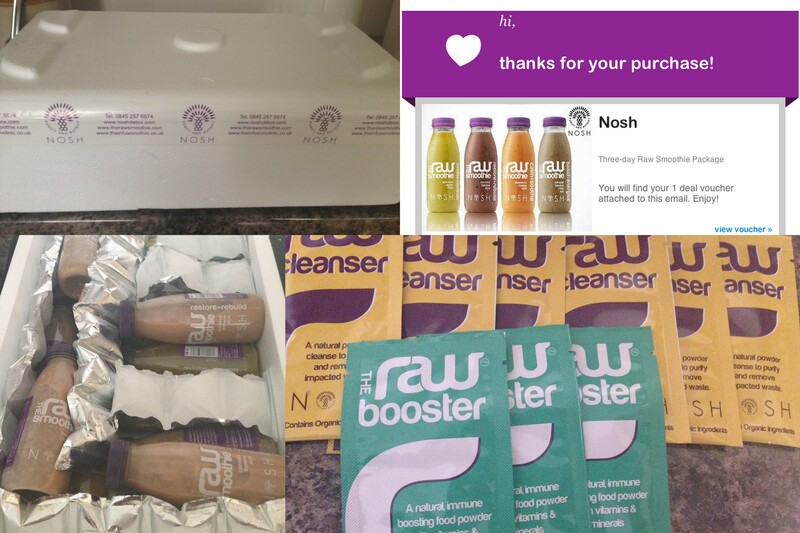 Overall, I’ve loved the Nosh Raw Detox 3-day smoothies. I certainly feel lighter and it’s also evidently worked according to my scales too. 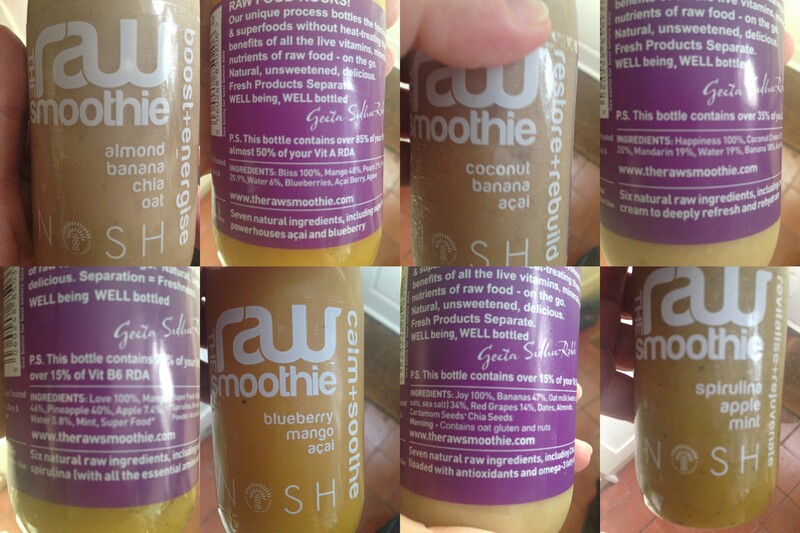 I enjoyed each of the smoothies, all tasted delicious. The properties in the cleanse sachets and superfood booster supplements clearly work too. 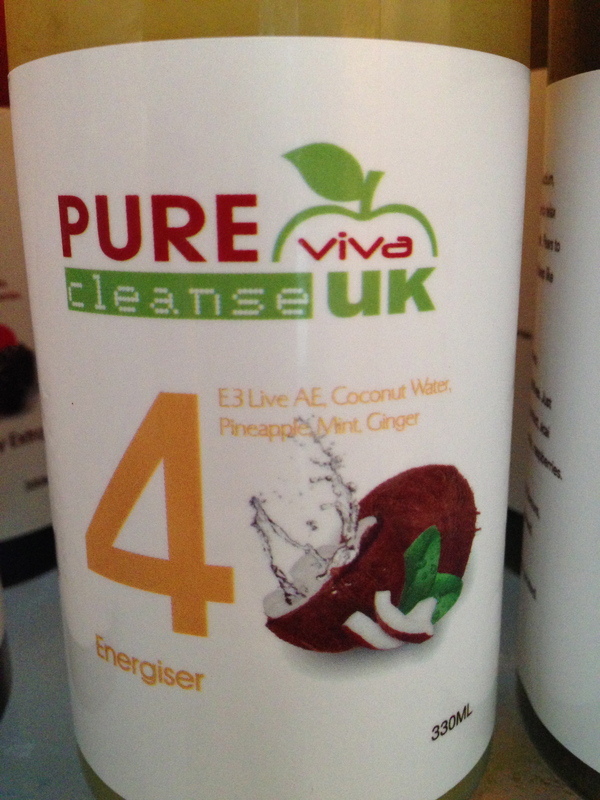 Most of all the ‘package’ is a wonderful short burst to feeling energised, lighter, cleaner and healthier. 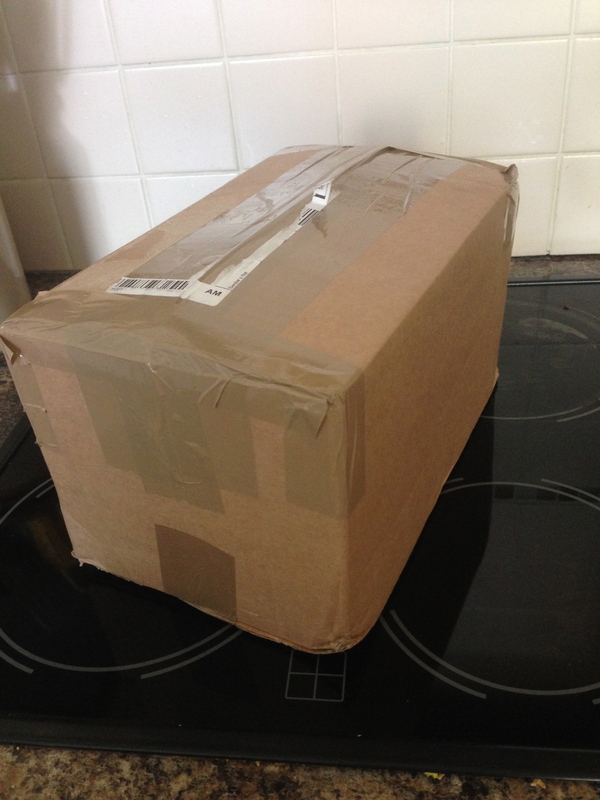 Late yesterday afternoon the courier arrived with a neatly packaged box from Soutmatefood. Inside the insulated box are my juices for the next three days. There was a icepack in teh centre of the juices however this had already melted. 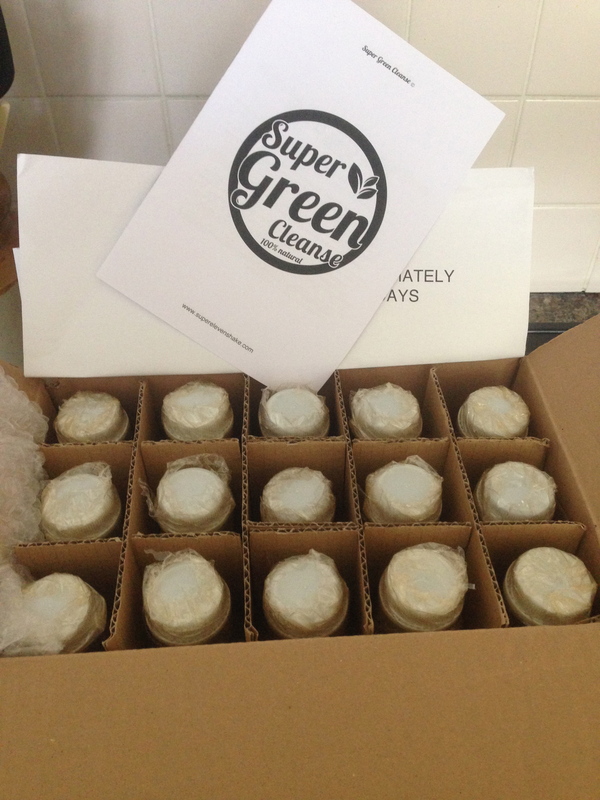 The inside of the box wasn’t particularly cool – perhaps worthwhile getting the delivery in the morning, if possible – hopefully the juices will remain fresh for the 3-day juice cleanse. Instructions read (shake and drink juices every 2.5hrs with plenty of water) and juices were put away in the fridge ready for my start today. 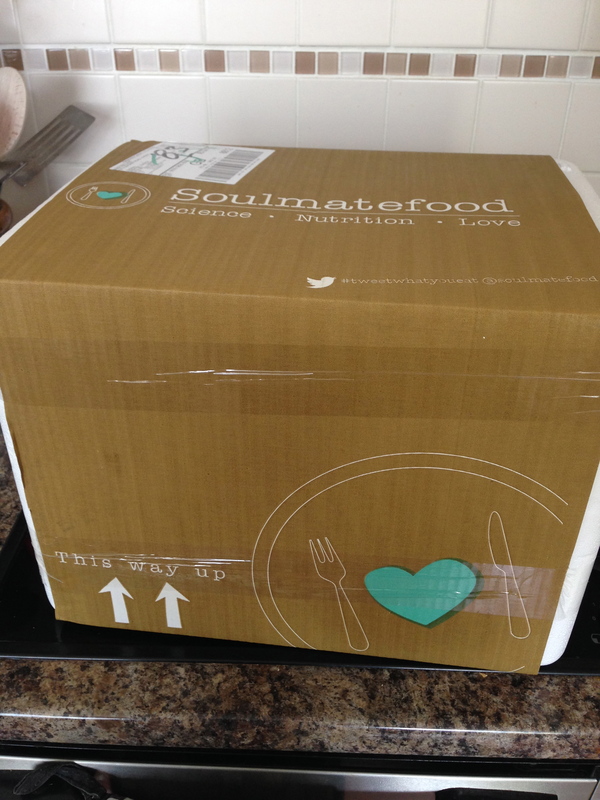 Once again I’m using a Groupon Offer to try Soulmatefood Perfect Cleanse. 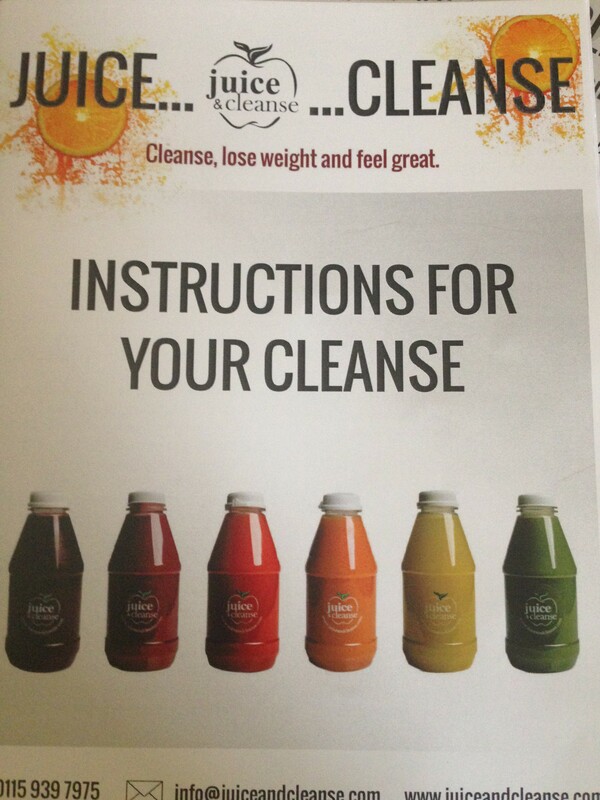 Normal price is a whopping £195 but with the deal it’s £65 for the 3 day cleanse (+ £5 delivery). 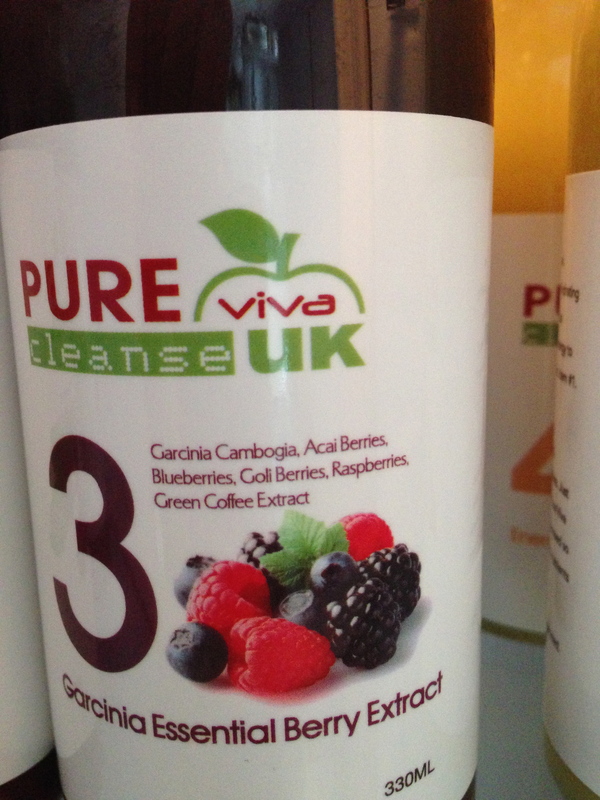 Reducing each bottle of goodness from £13 to £4.33 each. The Soulmatefood Perfect Cleanse, the world’s first hypostatic cleanse has intense alkalising and anti-oxidising properties, giving your skin a healthy glow and your body packed full of vitamins. Our nutritionist has given us some great, insightful facts for each of our 6 steps! DO refrigerate the juices immediately. 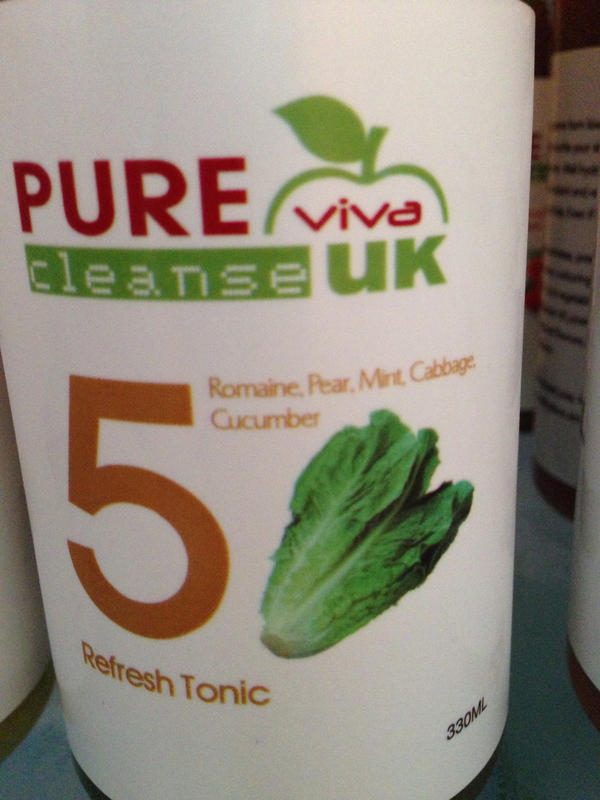 DO sip the five parts of your cleanse in order throughout the day alongside 5 glasses of water. 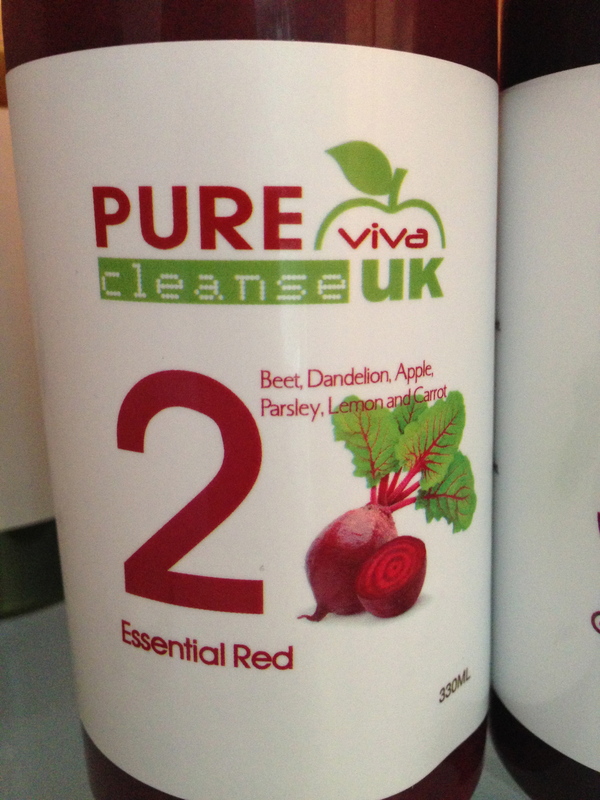 DO exercise lightly whilst on the cleanse. DON’T drink coffee or alcohol whilst on the cleanse. Enjoy your juices every two and a half hours and make sure you shake them well! Some interesting ingredients and combinations however I’m concerned that the majority of the juicy content is fruit and therefore probably quite sweet. I know that, for me, sweeter juicing means that I often crave ‘bad’ food types during and after a cleanse. I’m also concerned that the bottles are 250ml each meaning a total of only 1.25 litres of nutrient based juices each day and a hankering for breads! We will see. Watch this space! 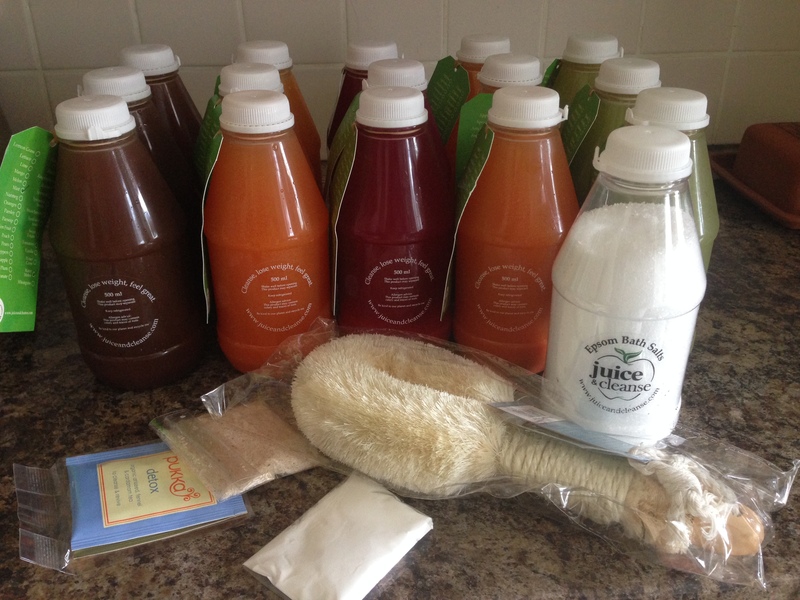 I completed the 3-day juice cleanse yesterday evening. I haven’t felt the same ‘clean’ feeling that I’ve felt with previous cleanses and find myself a little underwhelmed with this package. Was I hungry during the 3 days? Yes. I found having 6 juices a day a struggle. I would have preferred less juices during the day but a larger volume in each ‘serving’. Each bottle was only 330ml in volume, mostly sweet in taste and thinner juices than I’m used to. This culminating in my going to the fridge more often (with 6 juices a day), feeling unsatiated and the sweetness leaving me with a craving for breads. 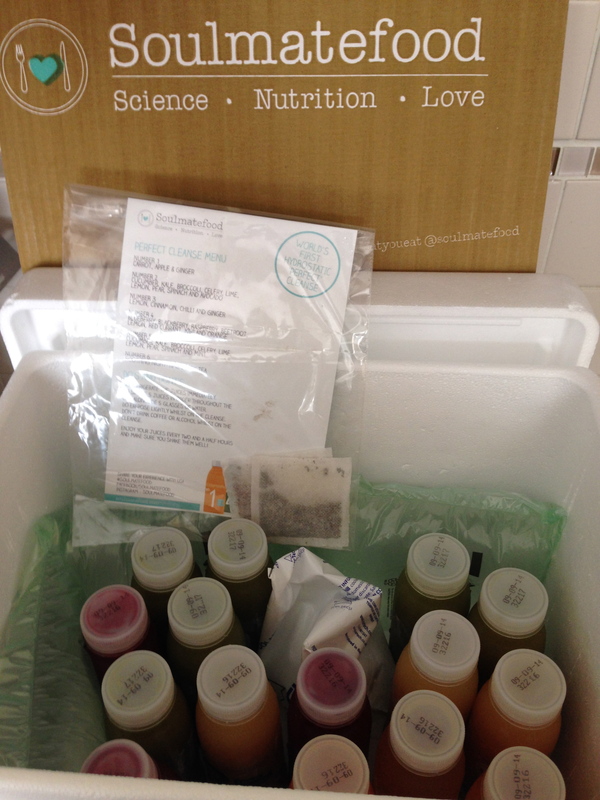 This package, being just the juices with no instructions or timetable, meant I neglected to drink as much water as was probably required, I felt ‘clogged’ and I constantly craved food. Usually at the end of a detox or juicing period I find that if I crave ‘food’ then it tends to be healthy options, fruit, salad or nuts. The sweet taste of these juices has left me craving unhealthy options so I wonder if my body isn’t alkalised following this cleanse. Did I get congested? Yes. Despite my taking digestive stimulator capsules in addition to the juices, there was little movement! TMI? Do the juices last in the fridge? Yes. There was less separation of the juice content during the 3 days but a good shake before drinking is required. Calorie counting? 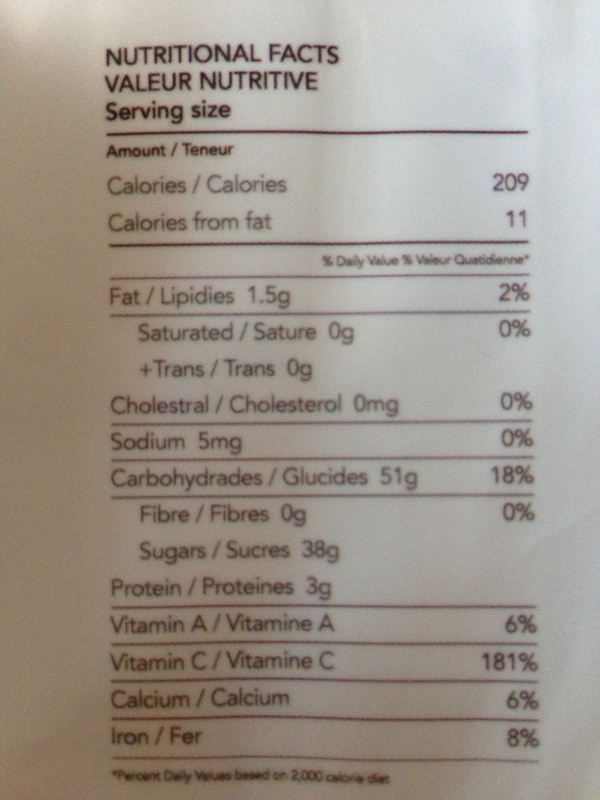 On each of the juice bottle labels are the nutritional facts of the content. This includes the calorie count for each. I was surprised that each bottle had 200-250 calories meaning that for a 6 juice day this worked out at approximately 1,300 calories. Would I do it again? No. I didn’t feel this pre-prepared juicing plan provide me with anything more than the juices which I could buy from Pret or similar outlet selling cold-pressed juices. Although caveat to that would be that as this was an offer at £59 +delivery it may work out cheaper. 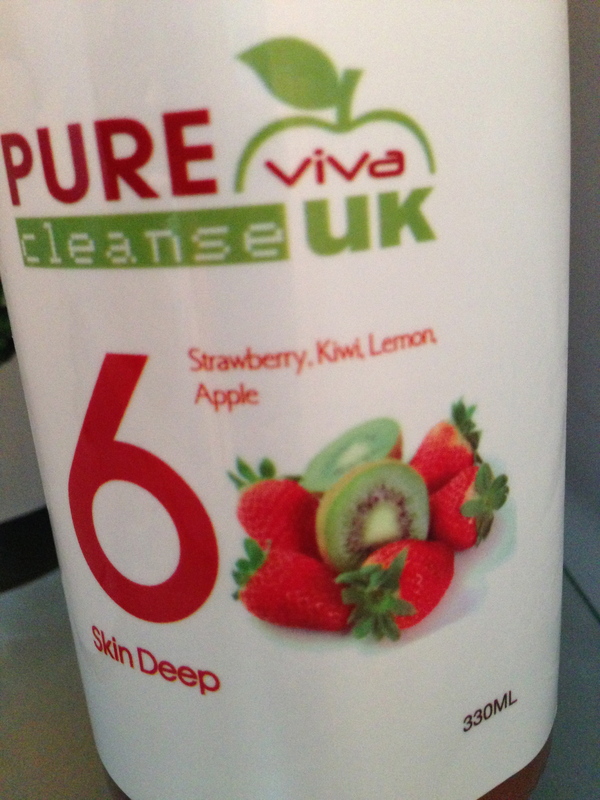 Would I recommend Pure Viva Cleanse? No. I didn’t feel the overall service was great. Ordering was cumbersome, my only phone contact disappointing and the juices were just juices ie no plan, instructions or information. Did it work and results? As a ‘cleanse’ probably not. I don’t feel ‘lighter’ nor that wonderful ‘clear’ sense of being that I usually feel after 3 days of juicing. I did however lose another 1.5kg. 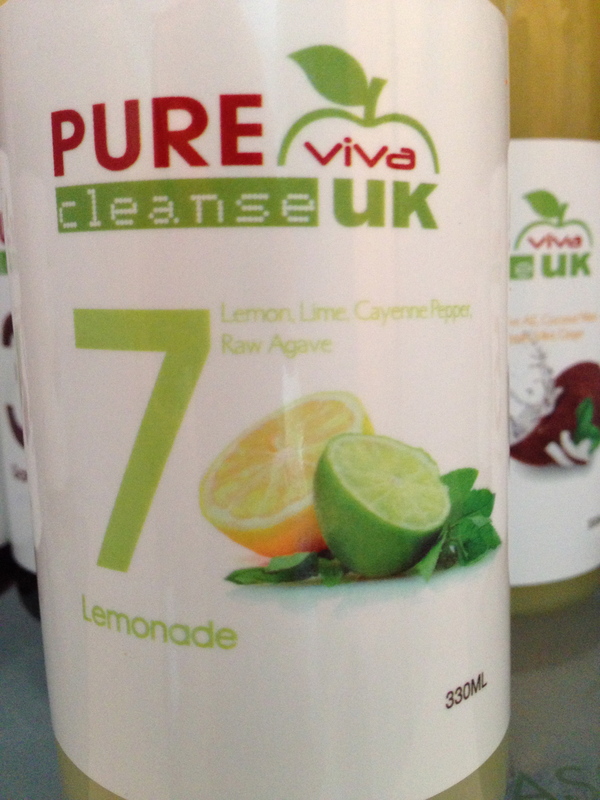 This morning saw the arrival of a new juice cleanse from Pure Viva Cleanse. 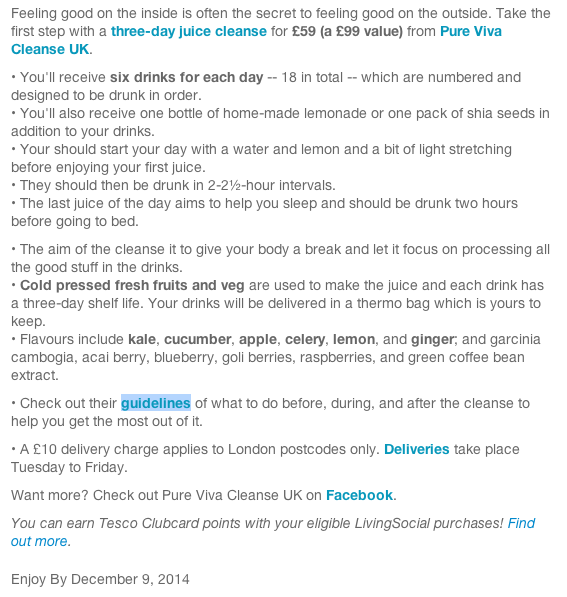 An offer from LivingSocial meant that the 3 day juice cleanse was reduced to £59 (normal value £99) together with a £10 delivery charge. The ordering process was a little cumbersome. Firstly you are required to make your booking online via the website. I would have then expected something further about arranging delivery but you’re left hanging with your account indicating that it is ‘on-hold’ but no further explanation. FYI despite my order having been delivered this morning this order in my account remains ‘on-hold’. I waited to see if the status would change or anyone would contact me – they now had my details in my account. A few days later when nothing had changed, I telephoned the number on the website. My call went through to a mobile and I felt was answered in an abrupt fashion. I enquired about how to set up the delivery date and was quickly told to give this information and order number over the phone together with payment details for the £10 delivery cost. When I asked about the ‘on-hold’ reference on the website being misleading I was told this was how the website worked. Not great customer service for a first time sale. Packaging – The juices are grouped into ‘daily’ heat-sealed plastic bags which are rammed into a chill bag. The contents are only mildly cold and the bag barely able to close. I’m also acutely aware that there are no instructions, leaflets or information within the package. 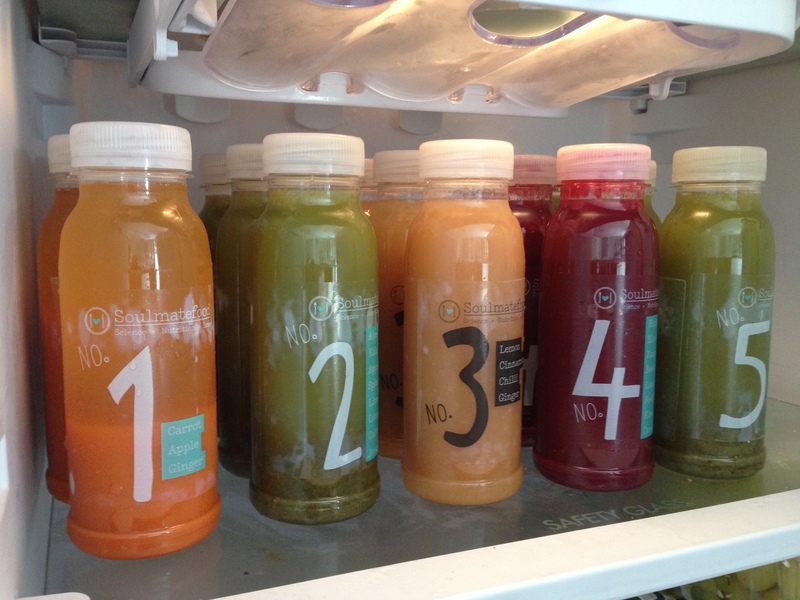 There are 6 juices a day, each in a 330ml bottle and numbered to make it easier. In addition there is a bottle of ‘lemonade’. 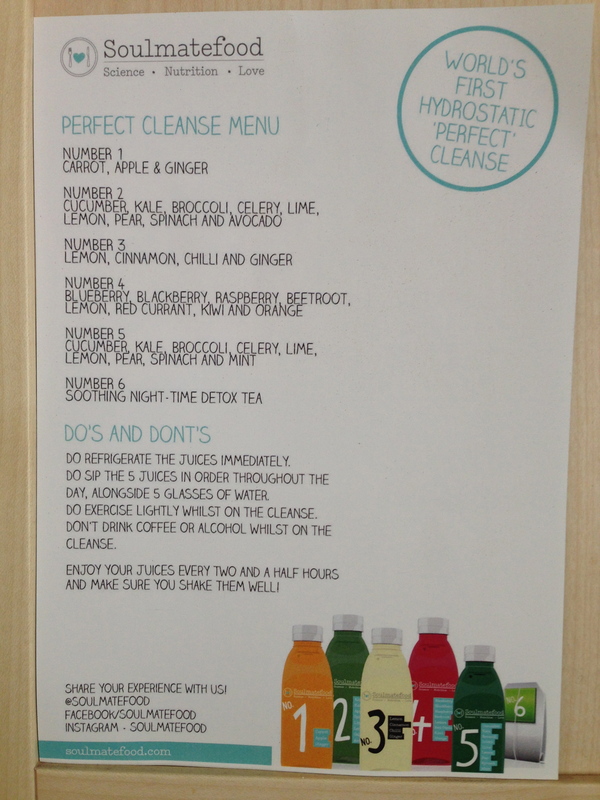 I’m unsure if this is a separate drink or like other detox juicing programmes contains lemon juice for adding to the first hot or cold water of each day. I have looked at the website for programme instructions, more particularly with reference to the ‘lemonade’ but feel the most informative programme instructions to be on the LivingSocial offer page. It appears the lemonade is an additional drink and I will need to buy some fresh lemons for my morning water and lemon ‘wake-up’ drink. Enjoyable green juice. 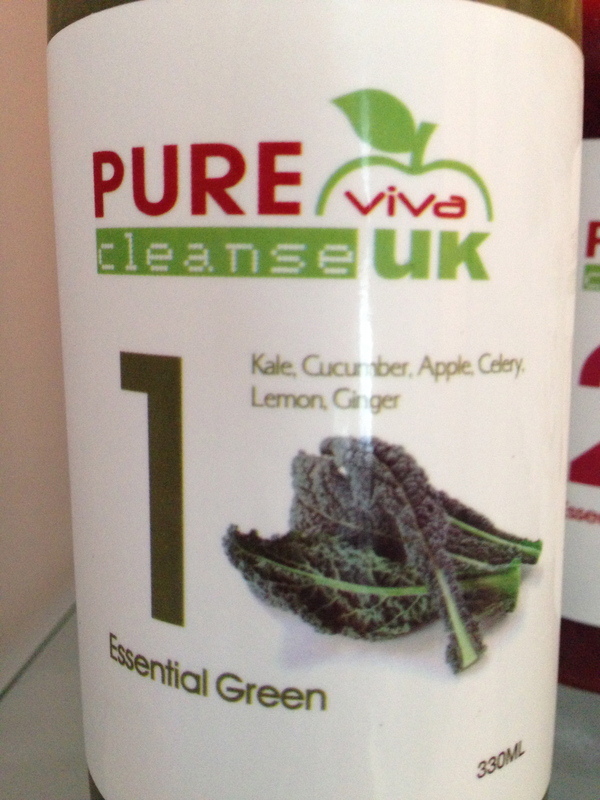 Not too ‘green’ in flavours for those new to juicing! 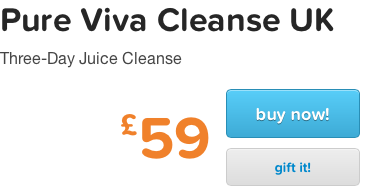 I’ll let you know how I’ve got on with this cleanse in a few days. As you know I’m very familiar with juicing now and happy to create my own juices or follow a Juicemaster plan. However I wondered what the pre-prepared juices were really like and if this might be a solution when I’m busy or working again. I’m keen to continue with the juicing as the many health benefits are obvious to me… the migraine headaches that had plagued my life for the past 2.5 years have still not returned, I’ve lost weight, I’ve a heap more energy and most of all feel lighter in body and mind. 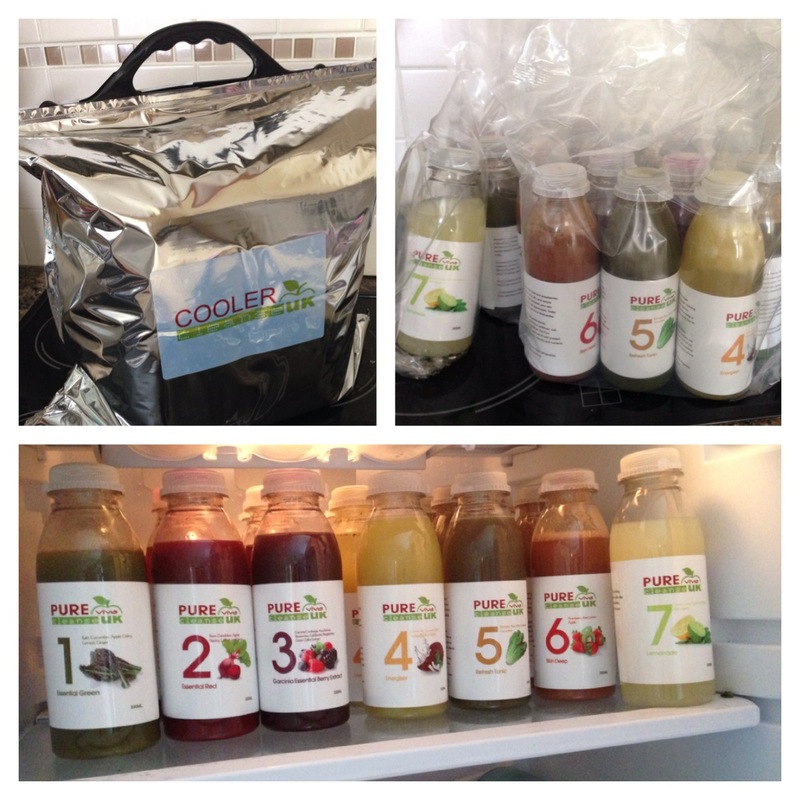 So early this morning a courier arrived with some pre-prepared juices and a cleanse plan from Juice & Cleanse. The juices were well packed in chill-packs to keep it cool. I chose the 3-day Tummy Trimmer plan. Half way through Day 1 and loving the new flavours. I started my day with a lemon shot in cold water (a great start to any day and usually I will have hot water with a hefty slice of lemon). Then I followed this with a glass of water with psyllium husks. This has to be drunk quickly as it turns a bit gloopy but is extremely beneficial during a cleanse to keep the ‘system’ going! I’m also drinking lots of water with a small amount of bicarbonate of soda dissolved in it. This morning’s juices were also new flavour combinations for me and both were delicious. As many of you know I love my teas. I’m happy with a pot of PG and indeed friends visiting me in Australia were always requested to pack as many teabags as they could into their luggage! But I’m also a great fan of more refined teas. In my last job there was always my glass teapot and a selection of teas to choose from on or near my desk. I love black teas, blends and interesting combinations including licorice and flowers. Since my juicing, I’ve tried to steer clear of caffeine and am more likely to add a slice of lemon, lime or fennel to a mug of hot water or a few mint leaves. HOWEVER I recently discovered the Bluebird Tea Company. Tea Mixologists! Whoohoo get that fancy title! I love herbal teas too but not a fan of the fruity numbers. 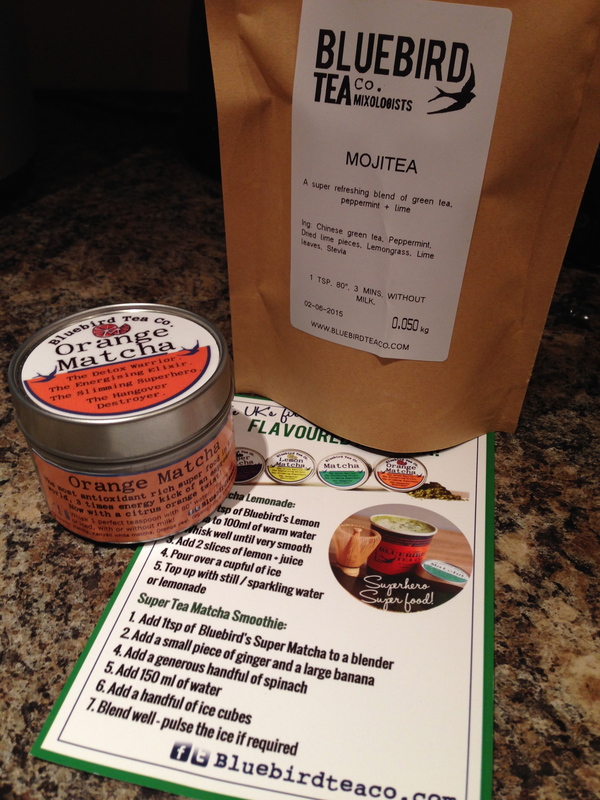 So when I discovered some of the blends made by the Bluebird Tea Company I was a very happy bunny, particular favourite of mine is the Mojitea – which is peppermint and lime. You can order their teas online OR take a trip to Brighton and find their shop amongst the Lanes. We sampled quite a few teas today and although delicious, I had to purchase my fave to bring back home. I was also delighted to see they blend their own Matcha and came away with a small pot of scrummy orange Matcha which I’m now adding to my juices. Wow I never thought I’d actually say that out loud! All those of you who’ve been following me on twitter, Facebook or reading a few posts here will know that I’ve been ‘giving it a go’. However I NEVER expected that I’d be making the above statement after only a few months. If my Mother was alive, she’d probably refer to me as a ‘juicing crank’, say I’m turning into my Granny or juicing as a ‘fad’. If Tish and Kerry were still alive, we’d be crazily swapping recipes and learning about the benefits of each ingredient. So armed with the experience of my recent 7 day juicing programme (and how I felt during and after the 7 days), I wanted to take it further. I wanted to understand more about how I can maintain the level of health gained, understand more about the nutrients, vitamins, minerals, pectin, etc etc that can be obtained via just juicing. Is it sustainable for longer periods. Indeed is it advisable for longer periods. Although I know with the lifestyle I lead that practically it isn’t possible but how can I incorporate it best into my lifestyle? As I’m about to enter the world of full-time employment again I also want to know that I can continue to do it and feel fabulous whilst working a full week. I looked around at different programmes and read many articles and information. However I knew that I realistically needed to immerse myself in it, with the experts on hand, to fully understand it. 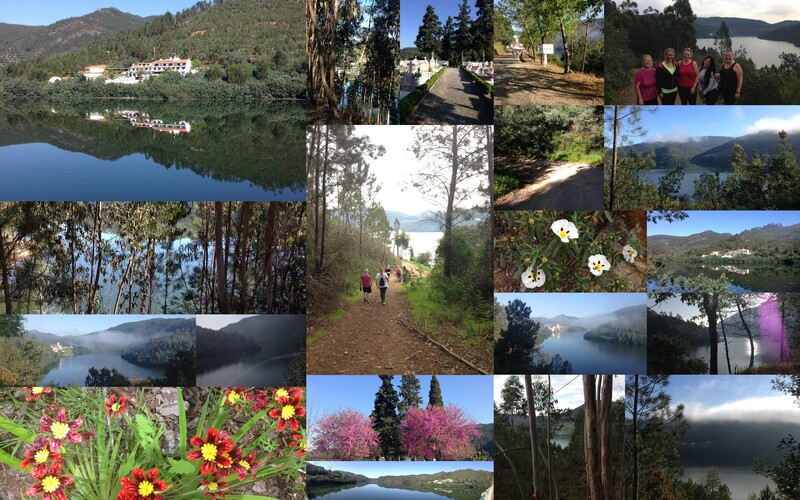 I then found Juicy Oasis in Portugal. 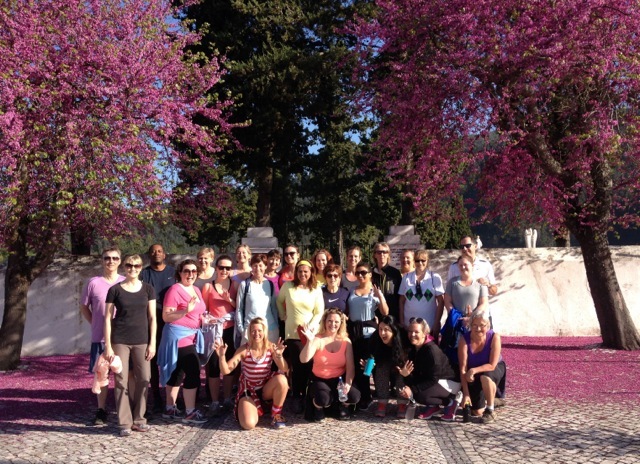 A Yoga, Fitness and Juicing Retreat. Fortunately there was a place sharing a room with a stranger in the Retreat in less than a month. Before I headed to the Retreat I wanted to make sure that I was prepared – mentally and physically. I read lots, continued to juice twice a day with one small healthy meal for dinner or lunch. 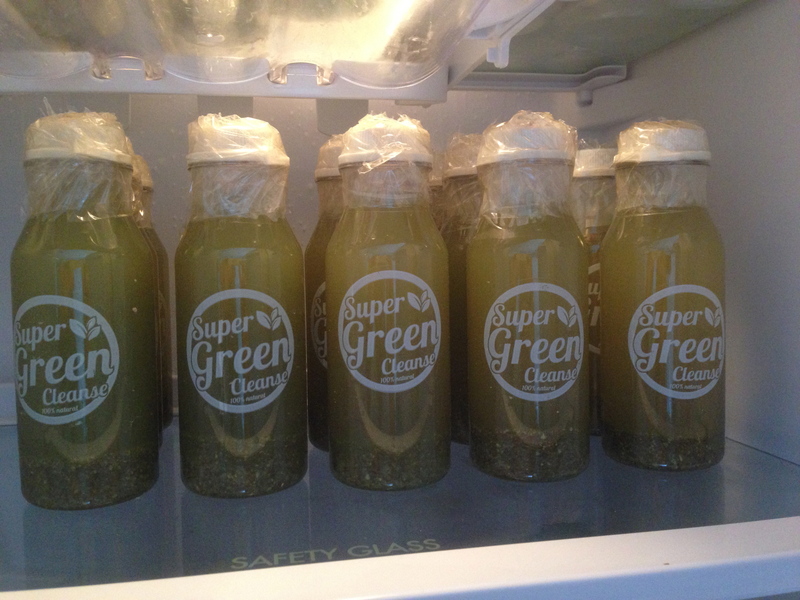 Last week I also joined in with the Big Juice Spring Clean – a 5 day programme of juicing as a community – via Facebook and twitter, all participants can keep in touch and also watch daily videos from Jason Vale (The Juicemaster) about the daily juices. My flight left early on Saturday morning. As I packed my bag with lots of sportswear, a couple of pairs of trainers, swimsuits and a tennis racquet, I contemplated slipping into the case an emergency supply of nuts (ooh how my tastebuds have changed since juicing – previously it would definitely have been chocolate). However I decided that the only person I’d be cheating would be myself and carefully put the packet of nuts back in the cupboard. The cost of the Retreat isn’t small however is good value for money. 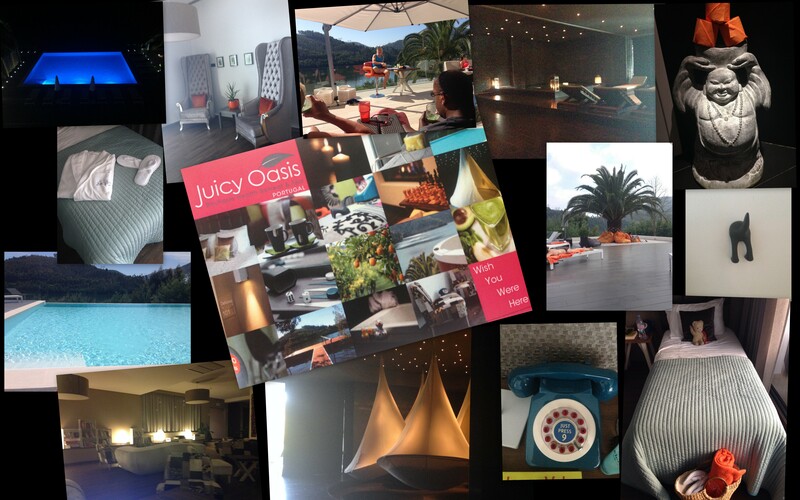 The Juicy Oasis itself is wonderful 5* luxury. The property has been recently refurbished to a truly high standard. The furnishings carefully selected and feel luxurious. The price also includes (as well as the juices and supplements) a programme of activity that keeps you busy both in mind and body throughout the day. I reduced the cost slightly by being able to use my BA frequent flyer points for my flights to and from Portugal. I was met at the airport and ushered into a minibus with another ‘Juice Retreatee’ for the 1.5hr transfer. The journey flew by as we chatted but not without noticing that the vista changed from City to country to beautiful wilderness. As we cross a bridge, our driver pointed out the Retreat nestling the other side of the river. Wonderful. Milly, the lovely Retreat Manager, met us at the door, checked us in and after dropping our bags into our respective rooms, took us on a quick tour of the Retreat. Wow Wow Wow! I just knew instantly that I was going to love it here. AND the sun was shining. It didn’t take us long to settle in, meet 2 others who were there for a 28 day programme (including my roommate, Sati), enjoy our first juice and then head off to the gym to work off the ‘flight legs’. Throughout the week you are able to join in with any or all of the activities. For some it was an escape from a busy life with a detox. Others joined with every activity. Most however dipped in and out. Below is a little video of the ‘daily activity boards’ to give you an idea of our itinerary. As you can see the activities were varied and filled our days. You could choose what you joined in with or indeed opted out from. I tried everything. With the exception of the final day I did the early morning walk. Leaving the Retreat and seeing some of the beautiful vista outside was a morning jewel for us all. I couldn’t get the hang of rebounding…. any of you who’ve done any aerobic-type classes with me, will know that my balance and coordination can leave other exercisers bashed and bruised. What I will say, is thank heavens for the post on the exercise platform that I was able to hang on to as I bounced off the rebounder! We were extremely fortunate that Jason Vale (AKA The Juicemaster) was also at the Retreat for most of the week. 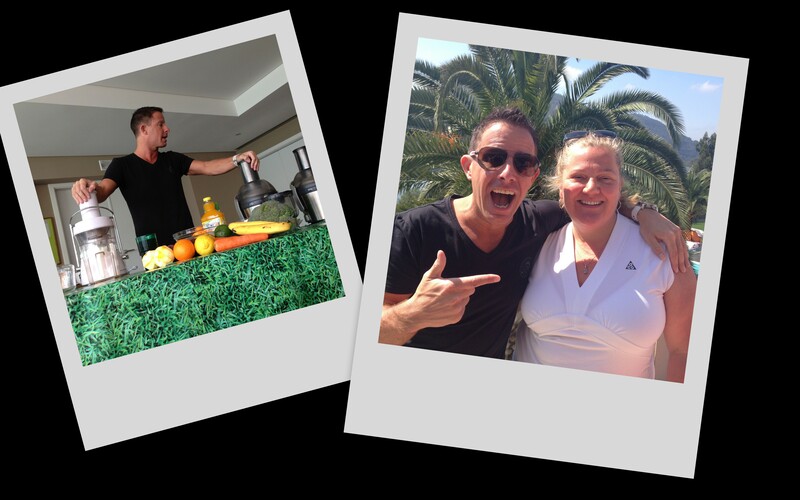 Ordinarily people pay to be at the resort with Jason and hear first hand why he’s got the name the ‘Juicemaster’, listen to his story and see first hand the energy and enthusiasm he has for creating a healthier society. Truly blessed to have some of his time. Oooh and play some tennis with him – boy is he competitive! The films each evening were yet more education into healthy eating and juicing. Obviously there has to be an element of objectively watching them as they’re filmed by advocates of juicing and perhaps not as two-sided as they could be. I certainly learnt an enormous amount from them though and indeed if every you needed the motivation and encouragement to truly join the Juicing Revolution, I’d recommend watching all the films.. in that order! Another truly wonderful thing about Juicy Oasis Retreat is the Eden Spa! 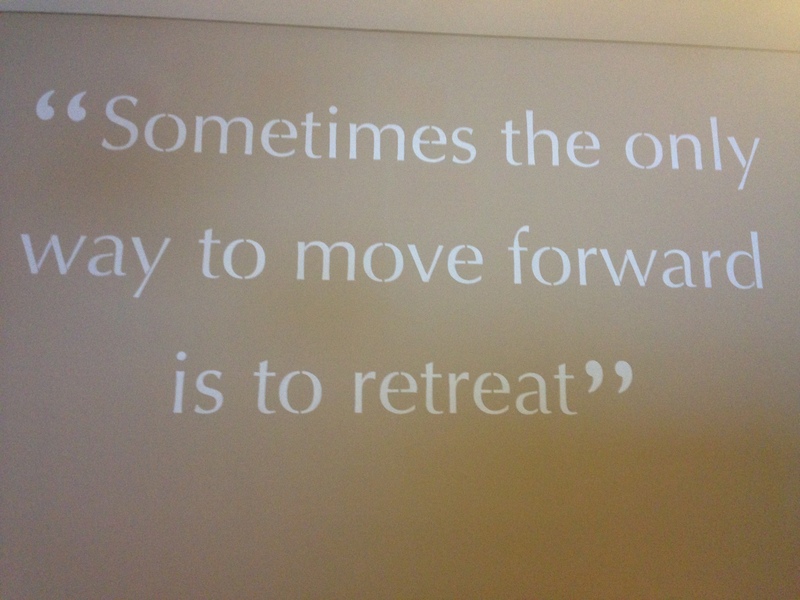 In the ground floor of the Retreat is a special place. The main spa room smells and feels relaxing. Just entering the space sort of puts a spell over you. There’s a small warm pool to lounge in. Beds to lounge on. And the most wonderful Cacoons. I so wish I could afford to have one of these in my garden. 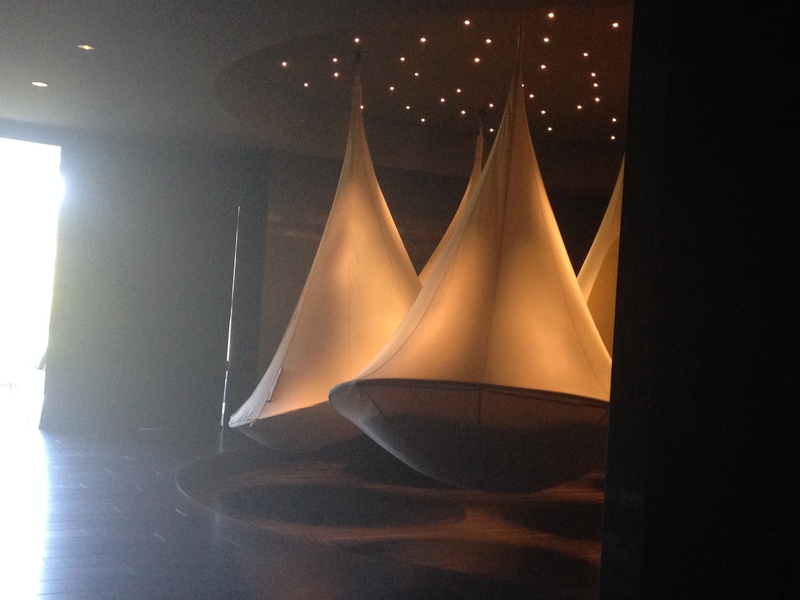 Within minutes of lying down in a Cacoon with the gentle rocking motion created by your breathing, I was asleep. Amazing naps which were so refreshing and deep. Also in the spa were treatment rooms offering a plethora of pampering, sports and detox treatments. During my week I took advantage of the spa for both pampering and detox purposes. I’ve never had a colonic, despite a number of friends trying to persuade me previously. 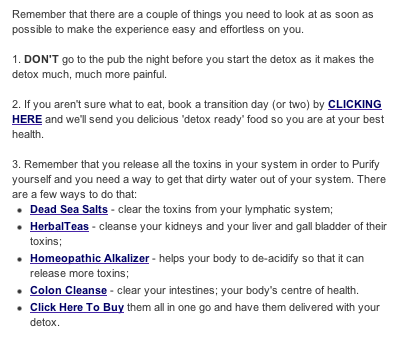 Before I left for Portugal I read up about the health benefits of a colonic. I read comments and reviews about any pain/discomfort etc. I attended the colonic talk on my first day and this confirmed that I would ‘try’ out this treatment whilst I was there. I won’t lie, the first one was a little uncomfortable – although I realise that I was a little more tense than I needed to be! I won’t go into more details but suffice it to say that I ended up having three colonics during my week. The first two with coffee (hey I had to have some coffee during my week’s Retreat!) and the last with wheatgrass. It’s difficult to explain how I felt after a colonic except to say lighter and more energised. Perhaps too much information for many of you and I’ll leave my comment there but suffice it to say that I do recommend them and will have more (when I find a good practitioner). I also had a reflexology treatment booked with an English lady call Aoife. Wonderful treatment. Absolutely blissful, relaxing and clearly this lady has magical hands. During this treatment I mentioned problems with my knee since my fall in Australia and that I’d noticed that Aoife offered Myofascial massages but that I understood her appointments to be fully booked this week. Kindly she offered to work for another hour on Thursday so that I could have treatment on my knee. Fascia is the soft tissue component of the connective tissue that provides support and protection for most structures within the human body, including muscle. Myofascial release is a soft tissue therapy for skeletal muscle immobility and pain massage. It didn’t go unnoticed to me that Phyllodes is a soft tissue sarcoma that is within the connective tissue of the body either. OMG Aoife really does have magic hands. For an hour she gently manipulated the skin, gently massaged and touched my legs. I can’t explain more about what she did except to say that whatever it was it felt fabulous. After the treatment I rushed upstairs to join everyone for soup i.e. ‘warm juice’. I suddenly stopped at the top of the stairs stock still as the reality dawned… no pain in my knee! For over a year I’d been unable to walk up steps and stairs without shooting pains. It’s gone. Totally. For the rest of the week I cautiously walked up and down stairs waiting for the pain to return.. so far it’s still missing! Wow – what a joy. Incredible. More information about UK practitioners here. Finally I also indulged in a deep tissue massage. I hate touchy feely massages. If you’re going to massage, then get right in there1 Oh Boy she knew how to do that. Fantastically and skilfully manipulated and pummelled. As a solo traveller to the Juicy Oasis Retreat I was unsure who my fellow Retreatees would be. Shortly after arrival I realised that we’d have a ball all week. A grand mixture of people from Belgium, Germany, Ireland, Dubai, Spain and, of course, England. I’d not, however expected there to be four of us from within a square mile of my house! We made up a mixed bunch of lovelies. Ranging in age, both men and women and, of course, levels of fitness and health. But what we definitely were also was supportive of one another. We had a jolly good giggle too! The daily schedule of activities meant that there were many times when we you busy doing something and seemed to only catch up with some others at juice times! Or me and my roommate at bedtime. Oh and to answer the question that seems to be most asked about my Retreat. Did we just have juices? YES! As you can see from the programme they were spaced throughout the day. Varied in deliciousness. Full and balanced with nutrients and vitamins. As we were on the ‘Winter’ programme at the Retreat, our evening Juice was warm… i.e. Soup! On our departure day we were allowed to order food for lunch or takeaway for our journey…. every taste of my salad was an explosion in my mouth. 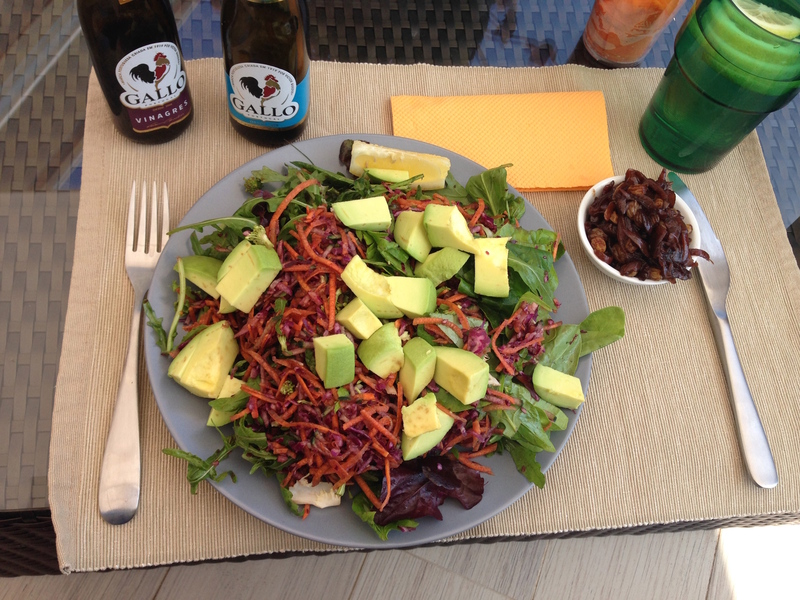 Amazing how much I craved good healthy salad food. 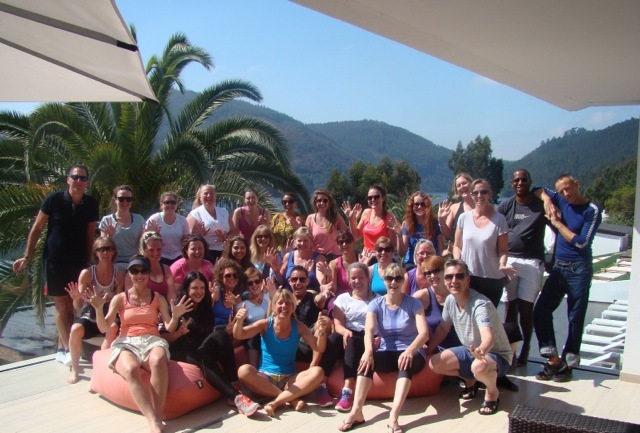 So what did I ‘gain’ from doing the Juicy Oasis Retreat? I strongly suspect that you’ll be seeking the answer to ‘how much did she loose’ question… I would too. However what I actually gained (and lost) was so very much more than that. Weight-loss is a by-product of the experience… a welcome one.. but not one that is anywhere near the top of my list. My headaches are gone. At least I’ve not had one single headache/migrane since part way into my first 7 day juicing experience. There’s a part of me that is constantly checking that they’re still not there. Certainly there’s a part of me that’s celebrating that I wake up when my body wants to wake not when the ‘nighttime’ headache gets too bad to bear. Finally I’m able to think more clearly without the drumming in my skull. I don’t need to lie down in a darkened quiet room. I can read without feeling as if I’m looking through a windowpane in the rain. I’m also no longer popping prescription and non-prescription medication to find some relief from the continual headaches. Gosh if I’d known I could shift them with juicing months/years ago, I’d have done it in a heartbeat… Hmmm maybe I should tell the neurologist, Dr, MRI team etc how I shifted the headaches? I no longer have shooting pains in my knee when walking up steps – thank you to the myofascial massage skills of Aoife. My skin is glowing with health (and noticed by quite a few people). My eyes are brighter and the whites truly white! My energy levels are soooo much better than they were before. I now wake up earlier and have a list of active jobs to achieve each day that no longer seem ‘impossible’ to do. I feel lighter and less ‘clogged’. I’m feeling ready to take on new activities. Looking for a bike. Joined a tennis league to accompany the tennis coaching sessions. I work out how I can fit in a walk to the shops/friends/activities into my day rather than leaving it until the last minute and jumping into the car. Oh and yes I did lose weight. 😉 2kg (4lb) lost – however given the exercise that I was doing on the programme and in the afternoons playing tennis, I wonder if some weight was gained in muscle! I did however take four measurements before I left (waist, bust, belly and thigh) – total lost was 28cm! Would I recommend it? Would I go again? Hell yeah! PS I think Jim Carrey’s clip on YouTube explains a lot. There’s a time to laugh, a time to cry, a time to live and a time to juice!